Many candidates prepare for questions commonly asked by panels during admission interviews. There are a plethora of websites offering insights into the kind of questions asked and their probable answers. Usually, there is one question asked at the end of the interview, and that is, “Any questions?” We never prepare for this. After all, we are not interviewing the panellists, are we? We ask questions like “How did I do?” or “When will I get to know the results?” which are really of no consequence. The interviewer is not going to tell you about your performance and the question about results can be answered by the support staff. So, what questions could you ask which would make an impact on the panellists’ decision? First of all, be familiar with the institute’s activities. You do not need to meet or search for people who know about the institute. The institute is as keen to sell itself to outstanding candidates, as you are to sell yourself to them. They would have showcased the things they are proud of on their website or in the brochure. You should have gone through this material in detail. Your questions should reflect that you are serious about joining this institute. Sir, going through the website I noticed that there is focus on industry interaction. Do the students also have a role to play in engaging with the industry or is it institute-driven? — This shows proactive nature as well as enthusiasm for taking part in the institute’s functions. There appear to be many activities during the year. Given my background, what kind of activities should I participate in, to develop my personality? — This shows your knowledge of the activities and desire to do something apart from academics. Is there a formal mentorship programme to guide us in your institute? You can discuss special interests or community activities, and ask how the school could help you pursue them. For example, I am an avid ( ), will there be an opportunity in your institute to showcase my talent? You could ask about faculty research or the school’s approach in an area that concerns you – I am a keen (), will there be an opportunity in your institute where I could contribute? What courses or activities should I engage in before joining your institute, which would enhance my learning experience? – This would showcase a keen interest in improving yourself and using the time between selection and start of the programme in a constructive manner. What are the student bodies that I could join to contribute to the institute’s legacy? Even at the age of 80, Dr Bala V. Balachandran, is an inspiration to many and a motivation to many more. His energy, enthusiasm, knowledge and, most importantly, wit are the key traits that make him so loved and respected by all. Having an opportunity to attend his class was truly a blessing. After interacting with this great gentleman, I often kept wondering what is it like to be successful at the age of 80? What keeps him going? When asked the same, Uncle Bala said, it’s the enthusiastic students and their never ending thirst of knowledge. Seeing, interacting, teaching and always being surrounded by people in their twenties make him feel twenty at heart and the love and respect that he receives from then is what encourages him to achieve more and do more for them. Well, this is ‘attitude being gratitude’ at its finest and speaks volumes about the character of this phenomenal person. It is in my personal opinion, that it’s not just being successful but doing it the right way is what differentiates the men from the boys. So, what was it like to attend his class? The aura of the class comprising of the enthusiasm of the students and the respect that he commanded were among the first oblivious things that can be observed. The constant humour, witty one-liners, the command and expertise over the subject (duh! he is the pioneer of the subject) and his constant real-time illustrations are the composition of his class. The key take away for a student from Uncle Bala’s class are the real life experiences shared, industry specific problems defined and the strategic methods implemented to solve the same which are in correlation with your academic subjects helping you bridge the gap and connect the dots. In his short stay of 3 days and 10 hours of classes, he has given us much to cherish and the impression that he has left on us students will be everlasting. 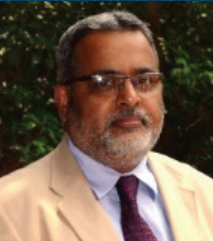 PURNA CHOUDHARY INTERVIEWED PROF. UMASHANKAR VENKATESH, DIRECTOR – PGPM AND PROFESSOR. PROF. UMA HAS A RICH EXPERIENCE OF OVER 26 YEARS. HE IS AN EXPERT IN THE FIELD OF MARKETING. Please brief us about your educational and work experience prior to joining GLIM, Gurgaon. PROF. UMA: To start with, I was an agricultural sciences student and earned a graduate qualification in agricultural economics before joining an MBA program. After my MBA, I worked in the FMCG industry for a while before reverting back to academics. Started my career as a faculty member in a state university and went on to a series of business schools in India, wherein in many, I was a founding member. In between, I completed a doctorate in management in the specific area of consumer behaviour. I have been deeply immersed in academic administration; entrepreneurship and quality management since my Lectureship days, which continues till date. Prior to joining Great Lakes, I was Professor and Area Chair – Marketing, at the International Management Institute, New Delhi. My research and publication focus largely around issues in consumer behaviour and marketing of services. My recent published work is in the area of internet shopper segmentation and use of social media in tourism. Two of my co-authored cases are published by Richard Ivey and are listed in the Harvard Business School Publication’s Case Inventory. I also conduct MDPs and other training programs in industry and academia mainly for banks, civil services, PSUs, hospitality companies etc. What interested you most towards the field of marketing? PROF. UMA: Always fascinated by aspects of consumer behaviour and trying to understand why people manifest a particular kind of buying behaviour. The underlying thought process and value system that individuals approach purchase situation with, is something that is of enormous importance for anyone wanting to be a marketing professional. I cut my teeth in marketing as a practitioner first and that too in the cutting edge area of sales management. The FMCG selling process is something that gave my first hand exposure to the dynamics of consumer buying behaviour and since then I have been learning new things about this every day. Please guide us with the various career prospects in the domain of marketing. PROF. UMA: Obviously, the digital space is the happening space and you should look at aligning your learning and skill building endeavours with this domain. Internet and mobile based businesses are ramping up at an astronomical pace and will remain a fertile area for future entrepreneurial and employment opportunities. Marketing analytics is another emerging area that will grow rapidly in times to come. You have the option of getting skilled in this area and leverage the same to create opportunities for yourself. Another thought that comes to mind is that we must readily lend ourselves equally to sales and sales management oriented roles within marketing along with other marketing roles such as – product/brand management; research; customer care etc. This will really enhance your possibilities and increase the scope of growth areas and roles that you may be able to land. If you are not teaching, what else do you like to do? PROF. UMA: I travel frequently to the hills whenever I find some time and find solace in reading stuff that I do not get the chance and time to read, which is fiction and poetry. Humour is an integral part of your lectures. How much of it would you attribute to your being a follower of Russel Peters? PROF. UMA: Well, I pre-date the gent so named hence he should be asked this question…!! On a more serious note, I do believe that this is an effective way to impart understanding as otherwise some topics and subjects can become a bit too dry and pedestrian to impart to a set of (impatient) learners.